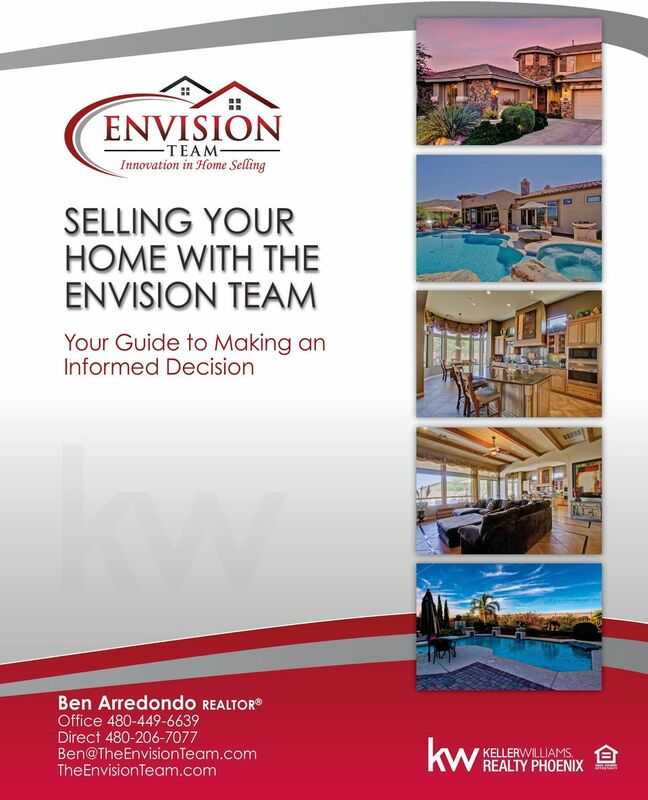 Download "SELLING YOUR HOME WITH THE ENVISION TEAM"
2 THE ENVISION TEAM GUARANTEE Our Dedication to Great Professional Service Communication Guaranteed We strive to keep you updated through the entire process of your home sale with weekly phone calls. If we fail to update you weekly or fail to return your call within 24 hours, we will give you a $100 cash reward. We use state of the art technology that follows up with every buyer that visits your house. You will receive your own log in to see the direct feedback that other agents and buyers have on your property. This allows us to overcome potential obstacles and get you more offers! Incomparable Service Clients come first and we ALWAYS have their best interest in mind. Our business is built on referrals from past satisfied clients. That is what we pride ourselves on most. Honesty We know the truth isn t always the easiest thing to hear but we promise not to mislead you. We will be 100% honest with you regarding your home s valuation. We will not tell you what you want to hear just to get your listing. We want to sell your home, not just list it. We will be transparent with our operations and marketing. Active Marketing Active marketing is very aggressive. We do not just sit and wait for a buyer to fall in our lap. We are on the phone every day actively calling buyers and sellers in your area. This allows us to match potential buyers with your listing. Over ten years of experience has led to a large database of potential buyers for your home. 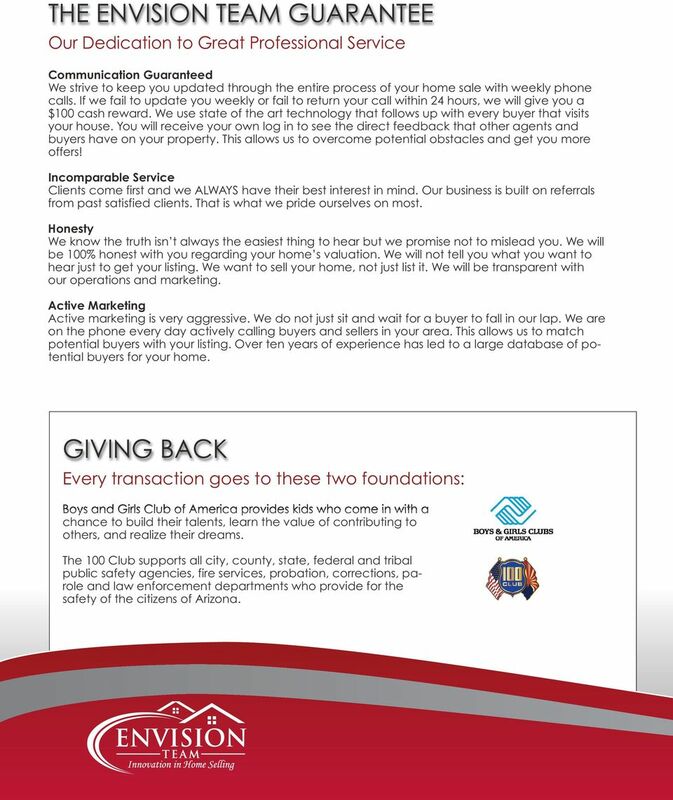 GIVING BACK Every transaction goes to these two foundations: Boys and Girls Club of America provides kids who come in with a chance to build their talents, learn the value of contributing to others, and realize their dreams. The 100 Club supports all city, county, state, federal and tribal public safety agencies, fire services, probation, corrections, parole and law enforcement departments who provide for the safety of the citizens of Arizona. 5 OUR MARKETING PLAN 1 Pre Market Investment Eye-catching signage and flyers. Professional Photography. Photos are more important than ever. You only get one chance to make a first impression and considering we syndicate our listings to hundreds of websites there is a very good chance your homebuyer decides to visit your home because of the online photos. We showcase our listings in the best possible light by providing professional photography on all of our listings for no added fee. Two hour home staging consultation. Professional home staging consultation with full written report. According to the National Association of Realtors, staged homes sell 80% quicker, and for up to 11% more money than non-staged properties. Window Washing. We hire a professional cleaning company to wash your windows to add great curb appeal. Matterport 3D Floor plans. Brand new technology. High-quality, rapid 3D visualization of your home. 2 3 *On homes listed at $250,000 or greater. Continued Marketing We dial over 1,000 prospective buyers on a daily basis. We will utilize our call center to prospect for buyers for your property. We use our expertise to price your home competitively. We submit your home to the Multiple Listing Service. Notify our entire sales team of your listing so they can present it to their buyers and investors. (Keller Williams has over 100,000 agents worldwide) Implement a circle-prospecting campaign to contact potential buyers in your surrounding area by phone and mail. Ability to pre-qualify prospective buyers with our in-house lender. This will ensure that only qualified buyers are viewing your home. We utilize a professional realtor referral source that gains exposure to even more buyers. Develop an aggressive print mail and door knocking campaign if necessary. 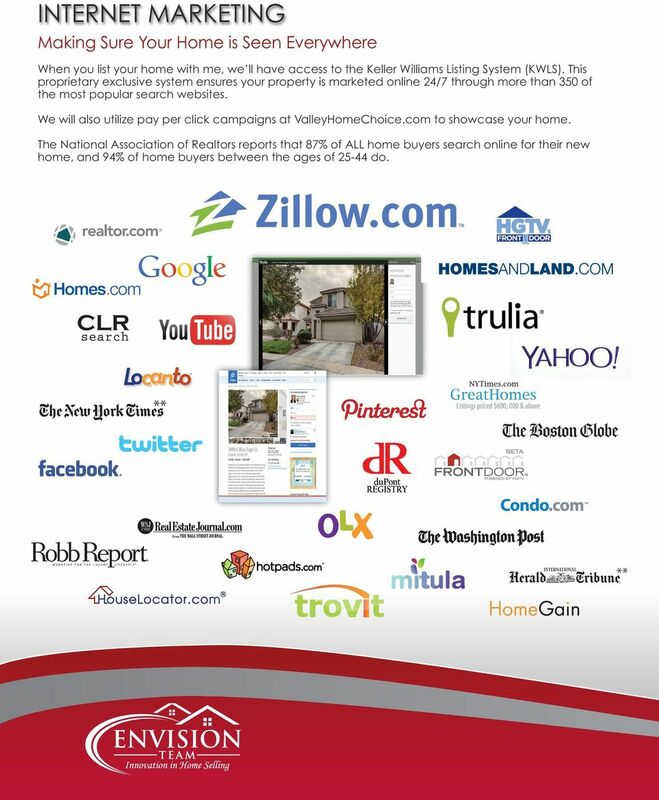 Promote your listing with its own website and on social media. Paid Placement on Zillow.com. This is the MOST traffic generated website in the world. Constantly update you as to any changes in the marketplace. When possible, we place your property on the area broker/agent area tour. Results We deliver your check at closing! 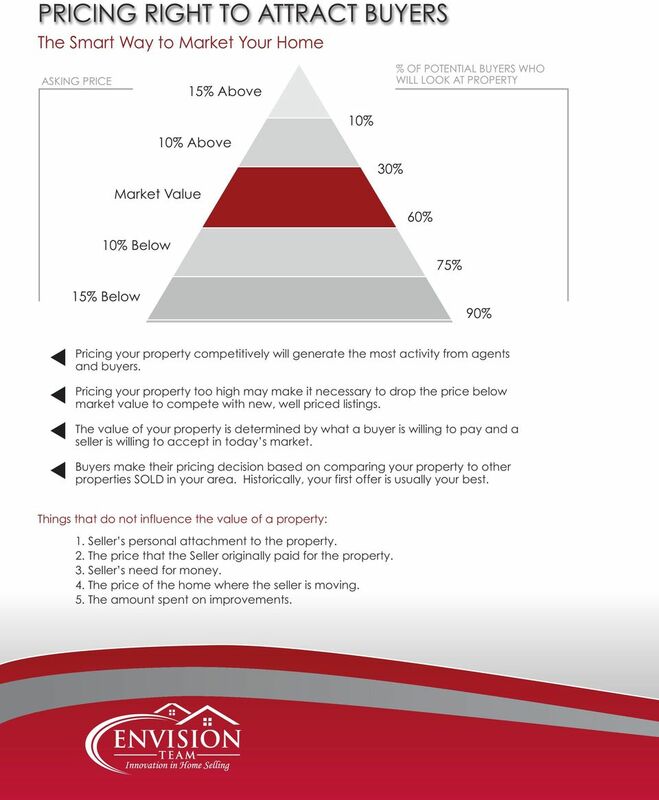 6 PRICING RIGHT TO ATTRACT BUYERS The Smart Way to Market Your Home ASKING PRICE 15% Above % OF POTENTIAL BUYERS WHO WILL LOOK AT PROPERTY 10% Above 10% 30% Market Value 60% 10% Below 75% 15% Below 90% Pricing your property competitively will generate the most activity from agents and buyers. Pricing your property too high may make it necessary to drop the price below market value to compete with new, well priced listings. The value of your property is determined by what a buyer is willing to pay and a seller is willing to accept in today s market. Buyers make their pricing decision based on comparing your property to other properties SOLD in your area. Historically, your first offer is usually your best. Things that do not influence the value of a property: 1. Seller s personal attachment to the property. 2. The price that the Seller originally paid for the property. 3. Seller s need for money. 4. The price of the home where the seller is moving. 5. The amount spent on improvements. 7 WHY KELLER WILLIAMS? We are the Largest Real Estate Company in the United States Keller Williams is not your traditional Real Estate company. That is why it is not surprising that it is the fastest growing real estate company in North America. Our phenomenal growth is only part of the story: The largest independent real estate franchise A network of over 100,000 real estate consultants 700+ offices in the US and Canada (50 Major Markets) Excellence in cutting-edge real estate training, real estate coaching and real estate education Most Innovative Real Estate Company Inman News Technology Leading-edge tech tools and training give me the edge in effectively marketing your property online, 24 hours a day, seven days a week! Through KW s exclusive Keller Williams Listing System (KWLS), your property is fed to more than 350 online search engines and available on KW s Web network of more than 76,000 sites. Best of all, because of Keller Williams Realty s My Listings, My Leads philosophy, every single Internet inquiry on your property will come directly to me so that I can follow up quickly on potential buyers for your property. Teamwork Keller Williams Realty was designed to reward agents for working together. 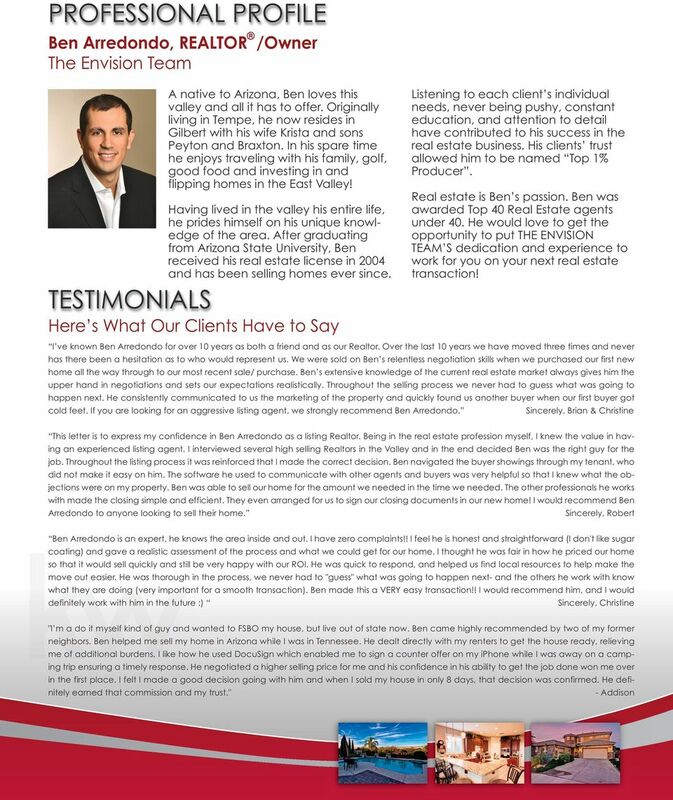 Based on the belief that we are all more successful if we strive toward a common goal rather than our individual interests, I m confident that every Keller Williams professional shares the common goal of serving you, my client, in the best way possible. Knowledge Keller Williams Realty helps me stay ahead of trends in the real estate industry through its comprehensive, industry-leading training curriculum and research resources. It s what prepares me to provide you with unparalleled service. Reliability Founded on the principles of trust and honesty, Keller Williams Realty emphasizes the importance of having the integrity to do the right thing, always putting your needs first. It reinforces my belief that my success is ultimately determined by the legacy I leave with each client I serve. Track Record I m proud to work for the fastest - growing real estate company in North America and the largest real estate company in the United States. It s proof that when you offer a superior level of service, the word spreads fast. A Guide to Buying your Home Personally Prepared for Mr. & Mrs. Buyer About Us Passion. Vision. Purpose. These words are synonymous with the Foster Beckman Group and the service we provide our clients! How s The Market? Am I Focused on Attracting Listings? A Residential Redevelopment Company. Why you should sell to Red Bow! Welcome to the Real Estate Agent Marketing Plan Course and things are going to start to get real now. Welcome to the Real Estate Agent Marketing Plan Course and things are going to start to get real now. 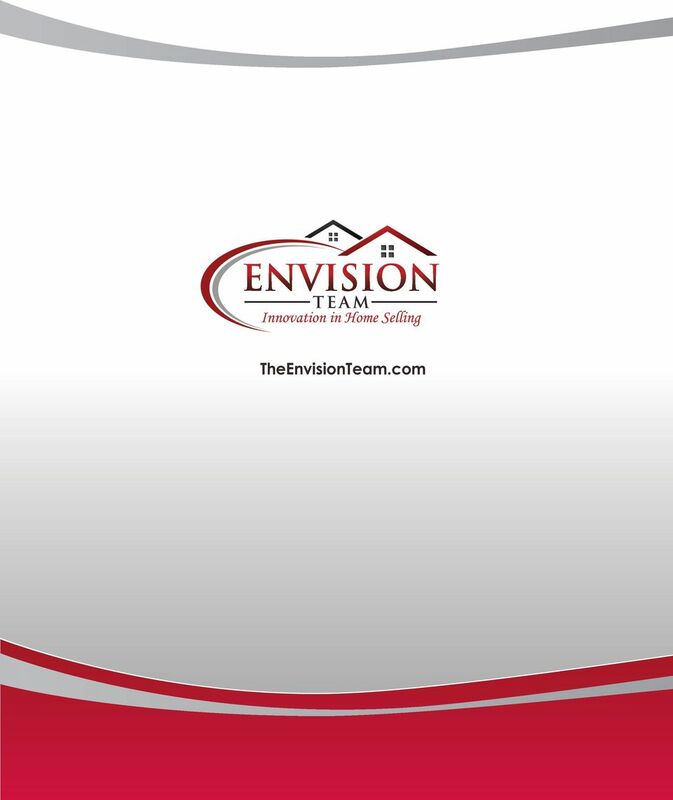 This workbook accompanies the 1st ebook, Selling the Art of Real Estate, in this marketing plan course. 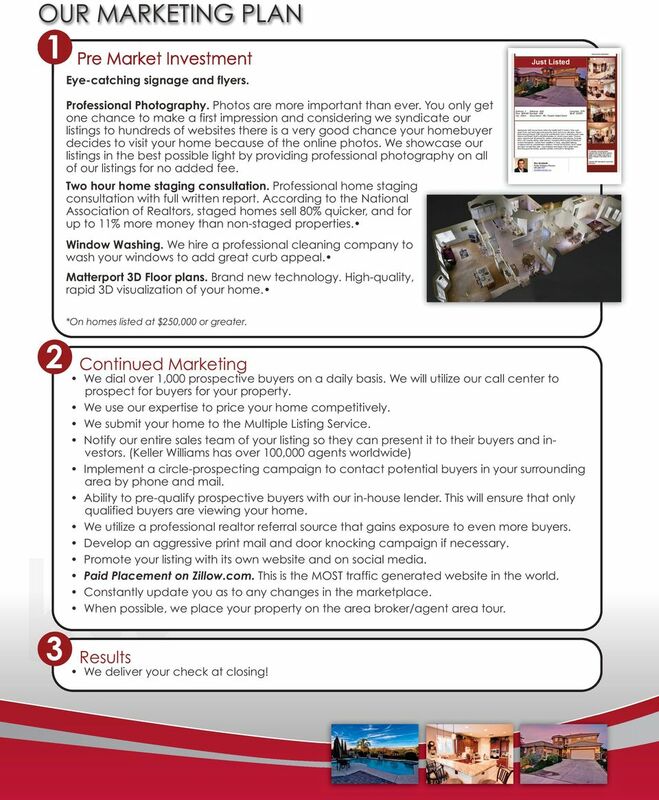 A Residential Redevelopment Company Home Selling Guide Who We Are? Important Facts About Core 5 Properties Core 5 Properties is a professional real estate solutions company located in Kenmore, New York. MARTIN MONTGOMERY Professional Profile METRO REALTY LTD LICENSED REAA 2008 INTRODUCING MARTINMONTGOMERY WHY SHOULD YOU LIST WITH ME? I am a full time Real Estate professional. It is all I do it is my career. With Mike s enthusiasm, professionalism and his love of the industry you are assured of a positive outcome every time. 5 STEPS TO RECRUITING *ROCK STAR AGENTS* Brought to you by: & 2 There are currently two schools of thought when it comes to recruiting real estate agents to work for you: the old way, and the new way.